Crans Montana is a Swiss resort in the central Alpine region of Valais - though it is actually a fusion of three villages; Crans, Montana and Aminona. 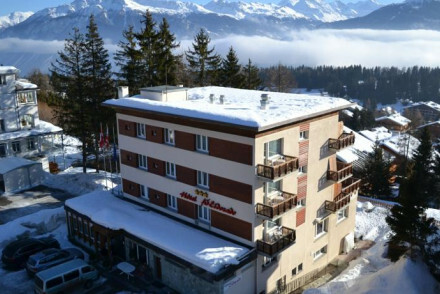 The best places to stay in Crans Montana offer easy access to both town and slopes. Like many alpine resorts, Crans Montana was ‘discovered’ by British winter sports folk in the early twentieth century. Set on a plateau 1500 metres above the valley the town enjoys panoramic vistas towards the South. On a good day, one can see the Matterhorn - and Mt Blanc is clearly visible too. There are over 140 kilometres of marked piste including the glacier at Plaine Morte (3000m). Most of the runs are of an intermediate standard, however, the sunny South facing aspect and sophisticated low-key atmosphere appear to attract a high standard of skier - this is where the discerning choose to practice their turns! The resort itself is very stylish in an old fashioned way and the skiing - despite it being a World Cup venue - is not the be all and end all. In the summertime, Crans is part of the European golf circuit, and it has also featured as the finishing post for stages of the Tour de France and the Tour de Suisse cycle races. And for music fans, there's an annual Caprice Rock festival - the only one in the Alps. Aside from walking and sport, this is a great place to simply come and relax. Everything is of the highest order that one would expect from a first-class Swiss resort. 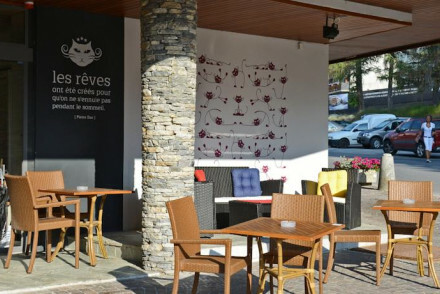 Crans-sur-Sierre is a shopaholics paradise with boutiques galore, Montana is more ‘bon marche’. Many stars have chosen to make a home here; Roger Moore and Sophia Loren to name but two! 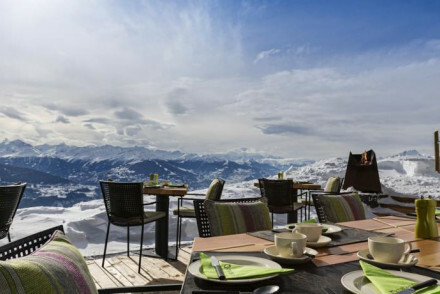 Whether you're here for winter skiing or a relaxing summer break, use our guide to the best places to stay in Crans Montana to help plan your visit. The Fondation Suisse des Trains Miniatures is a truly fascinating place to spend a couple of hours. Alternatively, head over to the Art Collections Museum which houses an eclectic display of Inuit art. Enjoy a day out with the family and go off on the Bisse du Ro walk to take in some fantastic views of the area. Le Crans Hotel and Spa. 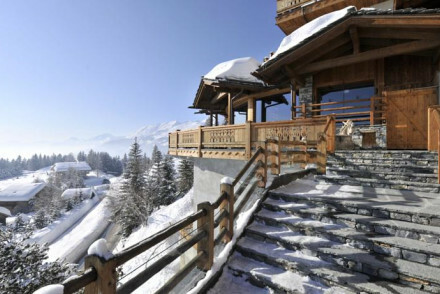 Just a short walk from Crans village this exclusive luxury chalet is minutes from the piste. It offers a top of the range spa experience not to mention a Michelin starred restaurant. This is the ultimate romantic mountain retreat! The minimalist Chetzeron, set in a converted cable car station, oozes contemporary class. With chic rooms, stunning views, and exemplary cuisine served up in their panoramic restaurant, it's a top choice. Helvetia Intergolf boasts spacious rooms with plenty of wooden features and an indoor paul, sauna, and a hot tub in which to unwind after a day out on the slopes. Ideal for families. 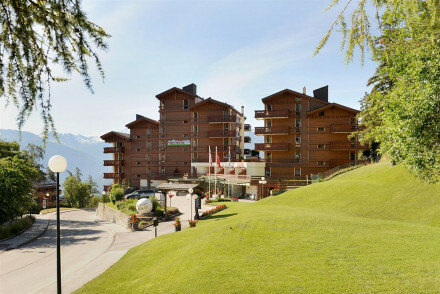 Hotel Central, Crans-Montana is a charming spot whose comfortable rooms have warm hues and easy access to the slopes. A nice base. 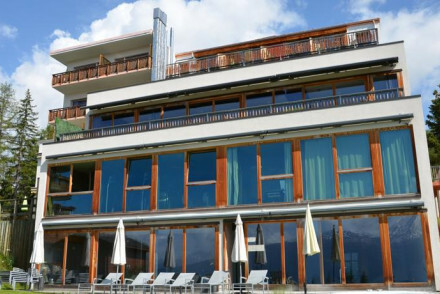 Crans Ambassador is a luxurious alpine stay with stunning views. The accommodation is ultra-chic, and there's also a roof-terrace as well as a choice of bars and restaurants. Hotel Art de Vivre boasts excellent wellness facilities and lovely rustic-chic rooms with various contemporary influences. Ad'Eldorado offers traditional rooms with private balconies, lovely regional food served up in the restaurant and a sauna in which to unwind after a day skiing. Guarda Golf Hotel oozes 5* luxury, with its smart wood-panelled rooms, two gourmet restaurants, and spoiling spa. Hotel Royal features pine-clad, super smart rooms with a spoiling spa and delectable cuisine served up in the restaurant. Hostellerie Du Pas De L'Ours is a 5* chalet with gorgeous accommodation boasting stone walls, fireplaces, and some even have spacious balconies. With an outdoor pool, spa, and jacuzzis, it's a top all-around spot. 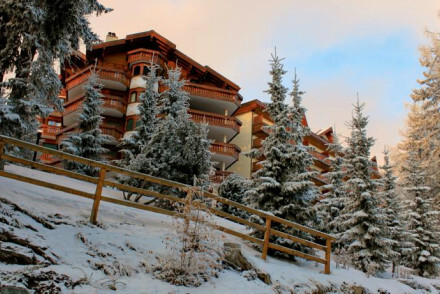 Les Sources Des Alpes is a luxurious spot with plush rooms and extensive spa facilities. The restaurant also serves up truly scrummy food - a wonderful choice. Parkhotel Quellenhof is a contemporary stay with accommodation featuring plenty of wooden influences and a restaurant serving up gourmet cuisine. Ideal for families. 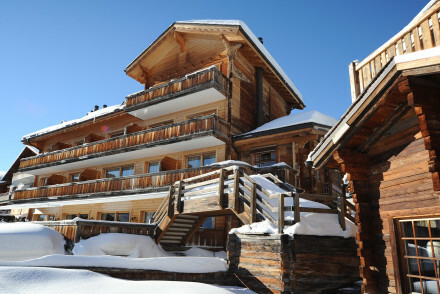 Hotel de Moiry is a charming stay with pine-clad accommodation and plenty of activities on offer. 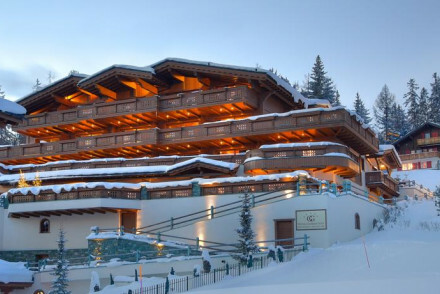 Hotel Alpina boasts ski-to-door access and simple rooms featuring plenty of wooden influences. Very family-friendly. Hotel Cristal, Grimentz is a charming stay with simple but comfortable rooms and a Finnish sauna. Grand Chalet Favre boasts four ultra-cosy, traditionally-alpine rooms which are bound to please. Enjoy regional cuisine on the terrace (if it's warm enough, that is!). Bella Tola is a 19th-century stay with traditionally-styled rooms which feature lovely bathrooms. Unwind in the spa or indoor pool before tucking into delicious cuisine from the restaurant. Maya Boutique Hotel boasts contemporary rooms with pine furniture and gorgeous views. What's more, there's also a spa and a restaurant. Chalet Des Alpes is a traditional stay with simple but comfortable rooms and lovely views over the Rhône Valley. The nearest place to fly into is Bern Airport, located 70km away from Crans Montana. From there, either take a shuttle bus or drive yourself over. Consider hiring a car with Rentalcars. If you're visiting for the skiing then come between December and March. However, Crans Montana is also lovely in the summer - the average temperature rises to 15°C in July. Browse our list of all the best places to stay in Crans Montana. Extend your search to include our recommendations in Verbier or Zermatt. If you're still stuck, feel free to contact a friendly guru for advice. A charming traditional chalet with gorgeous views overlooking the Rhône Valley. Simple alpine rooms with white-washed walls, wooden furniture and crisp white linen. The best rooms have access to private balconies. Close to the slopes. The location within a sleepy village ensures a relaxing stay. Skiing - 140km of groomed pistes ranging from 1400m to 3000m and efficient lifts make for minimal queuing. Active Holiday - Numerous Alpine activities throughout the year. A charming property in a central location with convenient access to the slopes. Well proportioned rooms with warm hues, large windows and modern bathrooms. Indulgent breakfasts served and a lively bar to unwind in the evenings. 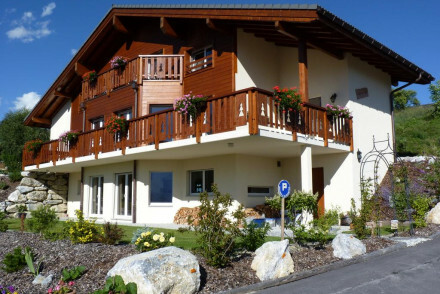 With friendly staff and great value, it's an ideal alpine base. Active Holiday - An excellent base for an active holiday, with comfortable elegant rooms and easy acces to skiing, hiking and golfing. Popular and elegant hotel overlooking Rhone Valley. Spacious guest rooms and apartments have blonde wood furniture, some with balconies. There is an indoor pool, sauna and hot tub for guests to unwind. Swiss specials offered in the restaurant. Outstanding panoramic views; great for families. A wellness hotel with stunning mountain views. Rustic chic rooms mix contemporary style with traditional alpine features. Enjoy regional cuisine in the restaurant, and an evening drink in the cosy lounge, complete with open fireplace. The well-equipped wellness centre offers total relaxation. Spa breaks - A wellness focused property complete with extensive spa and the healing qualities of the surrounding mountains. A luxury alpine hotel boasting spectacular views. Uber chic rooms with large floor to ceiling windows, crisp white linen, tartan fabrics and simply glorious bathrooms. There's a roof-terrace, complete with sheepskin rugs, for evening tipples and a choice of bars and restaurants. Mountain perfection. Skiing - Crans Montana offers 140 kilometres of pistes at a height of between 1500 to 300m which makes for good snow conditions. Active Holiday - With the Alps on your doorstep, whether skiing, golf or hiking is your pechant, there'll be something for everyone. Families - Babysitting available and plenty of activities to keep little ones entertained, giving adults some time-out. A charming property in the heart of the Valais Alps. Traditionally styled rooms feature wooden clad walls, sink-in-to beds and small balconies with lovely mountain views. Hearty regional dishes are served in the restaurant plus a sauna to unwind in after a day on the slopes. A great Alpine base. Skiing - Miles of beautifully maintained pistes. The hotel is located just a short distance from the lifts. Active Holiday - Alpine activities in abundance throughout the seasons. A luxury hotel boasting glorious views of the surrounding mountains. Contemporary throughout, chic rooms feature plush leather, polished pine wood and clean design. A glorious spa is the perfect place to completely unwind. The restaurant mixes bistro dining with gourmet cuisine. Totally fabulous. Active Holiday - Crans-Montana is the ideal spot for outdoor enthusiasts with easy access to the slopes, hiking trails and a golf course. Spa breaks - Make the most of the utterly indulgent and extensive spa, by the luxury brand L’Occitane. Five star chalet by Crans-Montana. Gorgeous rooms have stone walls, fireplaces, enormous beds and some, balconies. Outdoor pool, hammam, spa and jacuzzis plus a choice of three excellent restaurants with great wine menu from the cellar. No detail overlooked at this memorable stay. A seriously chic converted cable car station, with expansive glass walls offering epic views. Contemporary rooms feature parquet floors, bathtubs with a view and minimalist design. Exemplary regional cuisine and an excellent wine list offered in the panoramic restaurant. Truly unique. 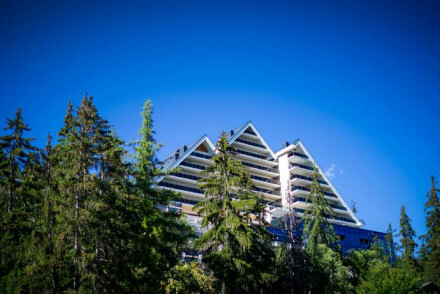 Active Holiday - Located above Crans-Montana with direct access to the slopes and hiking trails and only accessible by foot, ski or snowmobile. Hideaway - High in the mountains, with panoramic views of the Rhone Valley and the majestic Alpine peaks, from Matterhorn to Mont Blanc. A five star luxury hotel, built in all natural materials and surrounded by mountains. The chic rooms offer wood panelling, refined interiors and lovely views. Boasting a superb location, two gourmet restaurants and a fantastic spa on site. Characterful, charismatic and charming. Total relaxation - For the ultimate relaxing experience hit the spa with Finnish sauna, indoor pool, massages and therapies. Active Holiday - This area offers hiking, biking, ballooning, riding, hand gliding, golf, skiing and much more! Back to Nature - In an idyllic setting with open landscapes framed by towering mountains in the background. A luxury mountain chalet with extensive spa and relaxation treatments. The hotel offers beautiful rooms & suites as well as an exquisite, fine dining restaurant. Bedrooms are lavishly decorated with elegant interiors and fabulous views. Cosy wine cellar and stunning outdoor plunge pool. Active Holiday - Skiing in winter and numerous summer activities including golf, walking, biking etc.